Ecological restoration is critical when natural processes are disrupted. It can prevent further damage to the environment and promote wildlife and vegetation. Any type of development would be candidate for some form of ecological restoration. Green Side Up Env. Services & Landscaping provides ecological restoration of aquatic and terrestrial environments and is a preferred contractor to seceral Conservation Authorities, Municipalities and organizations. Our aim is to provide workable solutions to ecological and conservation issues by using survey, monitoring and experimental methods. With nearly 2 decades of experience, we will provide the most practical and healthy solution to any restoration project. Green Side Up Env. Services & Landscaping has worked with and continues to work with a variety of clients on projects. - Bio-engineering with brush matress, fascine and live stakes. GSU can also work with landowners and farms to develop different restoration plans and coach or represent the landowner through grant application processes that may be available to you. 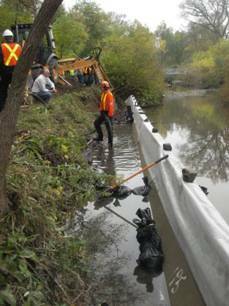 Projects such as stream crossings, fencing, pasture development, wetlands, fisheries, shorelines, and reforestation can qualify for funding from one source or another. The North American Native Plant Society (NANPS) awarded one of GSU's clients with the Rural Reclamation Award for work GSU completed on their property. This award reconizes plant communities and habitat creation, suitability, diversity, genetic provenance, ethics and aesthetics. Copyright © 2013 Green Side Up Env. Services & Landscaping. All Rights Reserved.